Capsugel produces 200 billion hard capsules and approximately 3 billion finished dosage units a year for more than 4,000 customers in over 100 countries. Our vast production capacity allows us to respond quickly and effectively to changing marketplace demands. To help meet the needs of our biopharmaceutical and consumer health and nutrition, Capsugel offers a comprehensive range of encapsulation equipment. Capsugel’s highly experienced technical service team is always ready to assist customers. Offering hands-on support for shop-floor operators and managers, they can optimize production performance and help prevent problems before they arise. They will also work closely with your key production and maintenance people to identify areas of improvement and to develop machine-specific action plans. We have 13 manufacturing sites and three research and development centers in nine countries across three continents. 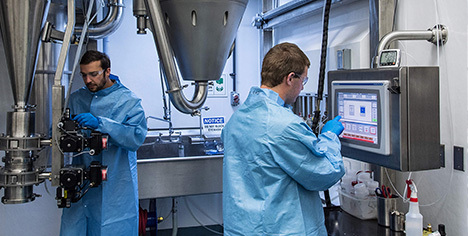 This vast global network – and the unmatched science and engineering behind it – enables the broadest range of capsule polymers, sizes and designs in the industry, as well as the ability to offer integrated product design, development, clinical supply and commercial manufacturing services to our customers around the world.